You are here: Home / Health / Lysol® No-Touch Antibacterial Hand Soap System: Making it Simple to Wash Away Germs All While Moisturizing Your Hands! Lysol® No-Touch Antibacterial Hand Soap System: Making it Simple to Wash Away Germs All While Moisturizing Your Hands! Lysol® No-Touch Antibacterial Hand Soap System. This system helps you ward off and wash away those nasty germs that you pick up doing every day things. It automatically senses your hands and dispenses just the right amount of soap. 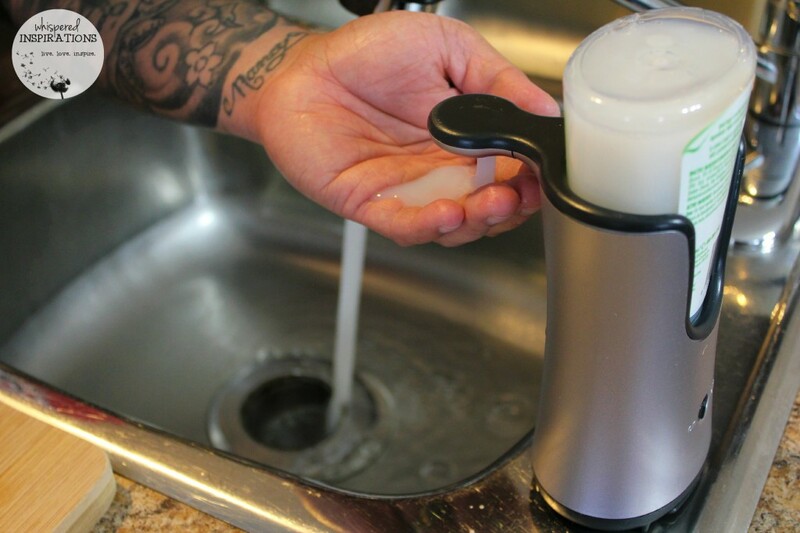 So, you can say good-bye to worrying about contaminating your soap dispenser by using this system. How is this possible? Well, simply because you just don’t touch it. 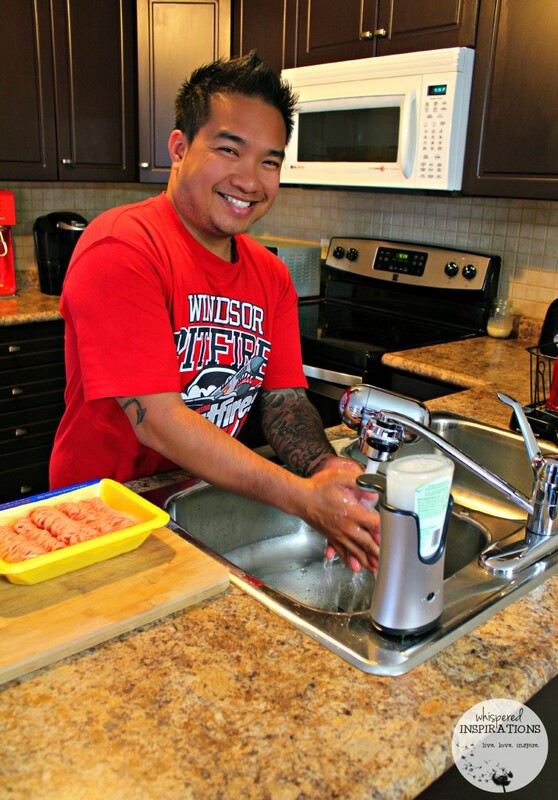 It is ideal for use in the kitchen or bathroom and it totally makes hand washing fun (especially for the kiddos) while helping to prevent and eliminate the spread of millions of germs that your hands can pick up each day! I’m going to pick up another one of the bathroom this weekend and I’m going to get it for FREE, you can too! I am a stickler in the kitchen. Whenever my Hubby or daughter cooks in the kitchen, I’m always the one reminding them to wash their hands in between steps and after they’ve touched raw meat. Which leads me to another issue that I worry about–meat juice on my soap dispenser and faucet. Yes, that leaves me disinfecting my sink thoroughly after every time the kitchen is used. Which is not a bad thing but, it seriously makes me wonder if I got all the germs. My Hubby was making some chicken meatballs and he forgot to grab the spices and ingredients he needed before he touched the chicken. Not to mention, he knows it’s a primal sin (in my kitchen) to touch anything (like kitchen knobs or fridge door) with meat juice hands because of the risk of cross-contamination. All you have to do is place your hand underneath the Lysol® No-Touch Antibacterial Hand Soap System and in seconds, you will have the perfect amount of soap to wash your hands. You can double up if you feel like it, I know I do and I get an awesome lather! The Lysol® Antibacterial Hand Soap refills come in a variety of scents and enriched with moisturizing ingredients. I love the moisturizing Aloe Vera & Vitamin E and refreshing citrus scents that you can get for the system too. Who doesn’t love having clean hands, delicious scents and they moisturize on top of all of that! You can find them at the grocer’s– so that’s easy access! All CLEAN and All SMILES. 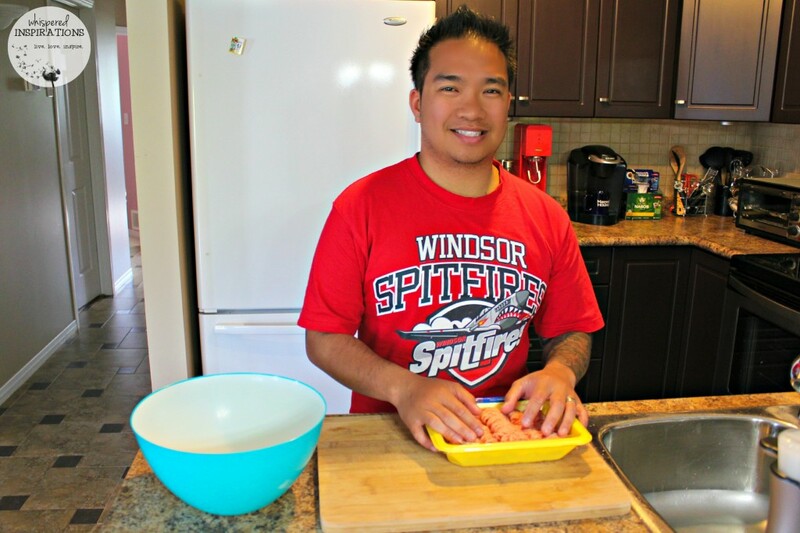 Hubby is all smiles in the kitchen now, we both feel confident that we are maintaining a clean home and not spreading germs that can make us sick. Not to mention, the Lysol® No-Touch Antibacterial Soap System makes it SUPER easy to deal with the aftermath of meatballs or saucy ribs! The kids can now dispense soap and wash their hands without spreading all the sauce everywhere. Well, I can cook and not worry anymore! Right now, you can try out a FREE Lysol® No-Touch Antibacterial Soap System by using a mail-in rebate offer, here. Believe me, you will fall in love! To sweeten the deal, for a limited time only, you can get $1 off any one Lysol® Hand Soap (Foam Refill, Lysol® No-Touch Refill, and Antibacterial)! So, whether you are prepping for a BBQ cook-out or your kid absolutely loves to make mudpies in the back yard. You are ready to take those germs on! You can be confident while you prep and the kids will love to wash their hands. Yes, they will love using the dispenser and you’ll be happy because their hands are clean and germ-free! 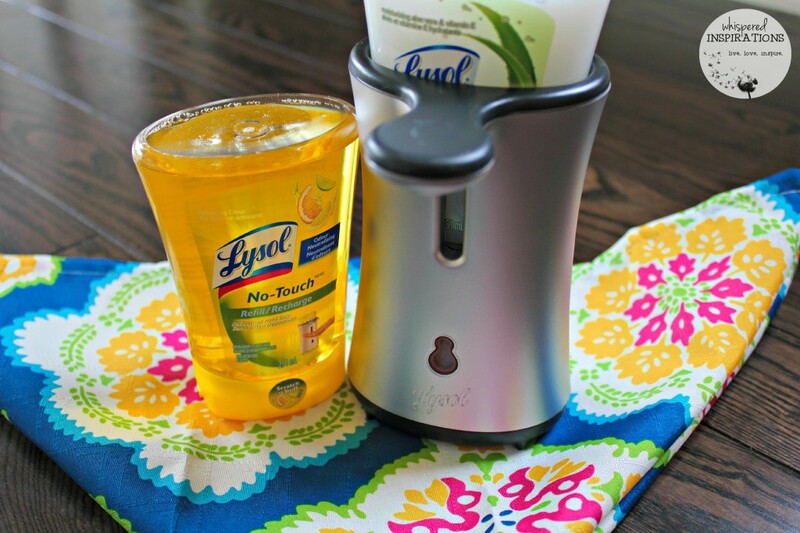 Have you ever tried the Lysol No-Touch Antibacterial Hand Soap System? Note: This post was brought to you by Lysol® via SheBlogs. The opinions expressed herein are those of the author and are not indicative of the opinions or positions of Lysol. I love my no-touch system, been using the white one for about a year. Lasts a long time and always seems to be the right amount of soap each time. I love the no touch idea – especially with with two germy little boys in the house! And they will love washing their hands! ok I definitely need to get that for the kitchen! I love having one of these in my kitchen. The kitchen is the main hand washing station in our house and of course I don't like touching the bottle with my raw meat hands. 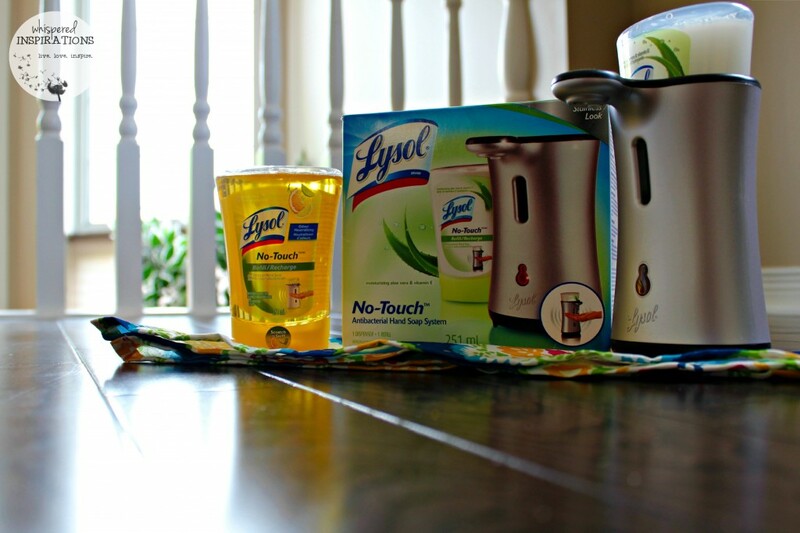 I love Lysol products and I know I totally need one of these!!! I always worry about germs!! I always worry too but, happy to have this! Super cool! I need one for my kitchen! Anything that moisturizes and cleans my hands at the same time deserves an A+. I could not agree more! 🙂 It is awesome. I totally agree no kitchen is complete without Lysol. I use it multiple times a day! I sure do, it is so \”hand\”y! That is definitely a must need for any kitchen, bathroom, play area, etc. where washing your hands a lot is a must do! I cannot tell you how many times I'm in the kitchen and I need to wash my hands in between things like cooking, cleaning, baking, etc. My son is weird about germs, so he would love for me to get him one of these lol. That way he doesn't have to touch the bottle and get it dirty while he's trying to get his hands clean. You sound like me with worrying about cross-contamination and germs. I'm obsessed with it! This is great! I have never tried a system like this but it looks great! perfect for the kitchen, I hate when I have meat hands and I have to wash my hands after and not wanting to touch the hand soap dispenser. That\’s why I love it in the kitchen, ewww to meat hands! I know, makes me shiver! LOL, this would be perfect for him! What a great product- ths would make an excellent teacher gift! I never thought of that So true! Great product! I love lysol products. Being able to use them with no touch is so convenient. We use one of these in my son's bathroom! I love my Lysol no touch, it's so handy in the kitchen. I hate trying to fumble with bottles when your hands are contaminated. Me too!! Really, really do NOT like that! What a great way to keep the little ones from getting too much soap! You have a really nice kitchen, and that is all I can pay attention too here!! I love my Lysol unit too! Awww, thank-you, it is small but, does its job. I love it, I picked up another one for the bathroom. I have one of these in the kitchen and it works great. It is perfect for those moments when your hands are covered in oil or chicken juice….when you don't want to touch anything but need to wash up. I bought one of these no-touch soap dispensers a year ago and continue to use it in the kitchen today. It's so handy.